A little later in the morning, compared to the previous scene. Sunlight illuminates this scene, from left to right. Jesus (in purple/red robe, seated) several Roman Soldiers. A tiny mouse, in the wall, near Jesus left hand. 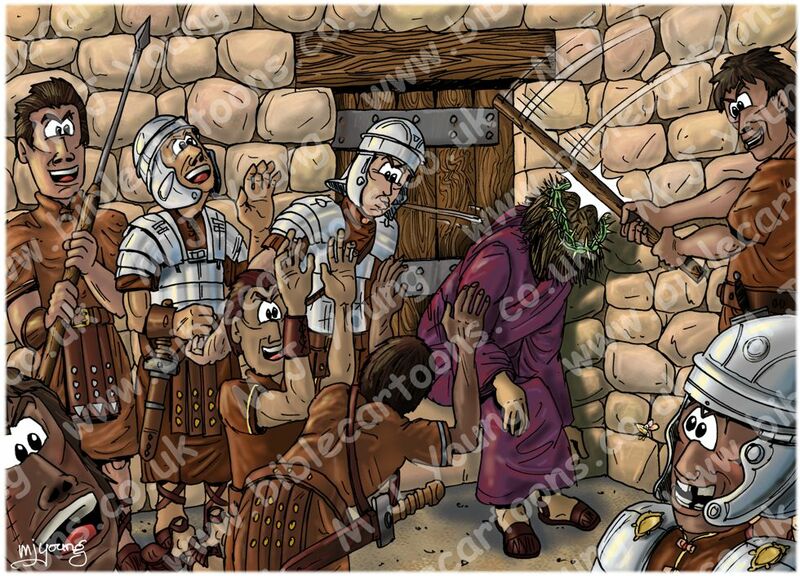 Like the previous scene, this was quite a harrowing cartoon illustration to draw & colour, showing Jesus being ridiculed & beaten by the Roman soldiers, after he was flogged. We can’t see Jesus expression, as his head is bowed under the weight of the blows from the stick. This scene comes after Pontius Pilate had passed sentence on Jesus & after he was flogged by the Roman soldiers. But Jesus torment & torture wasn’t over just yet, as this scene shows. Remember that the flogging a prisoner received greatly weakened him, in preparation for crucifixion, which is the cruelest form of capital punishment ever devised. One of the soldiers found a purple robe (though it may have been scarlet in colour, perhaps a faded discarded Roman soldiers cloak) & threw it round Jesus’ shoulders. There is some debate whether the crown made for Jesus was actually prickly. Some commentators believe the crown may have been made of spiny palm date fronds, or spina Christi. Equally it may have been the thorny nabk, which grew commonly near Jerusalem, and whose flexible & round branches could easily be platted into a crown. It could have been laurel (the plant more associated with crowns), possessing no thorns at all. It seems the purpose of crowning Jesus was not necessarily to inflict pain, but to insult & ridicule him. Matthew’s Gospel adds that the soldiers put a stick in Jesus’ hand, perhaps mimicking a king’s scepter (Matthew 27:29). 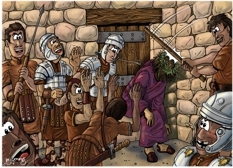 In any case, the soldiers beat Jesus, striking him on the head. They insulted him by spitting on him and kneeling down in mock worship. It’s interesting to note that all of this had been prophesied (see Isaiah 50:6; 52:14–53:6). Notice the tiny little mouse, looking up at Jesus with a tear in it’s eye, from a crack in the wall near his left hand!